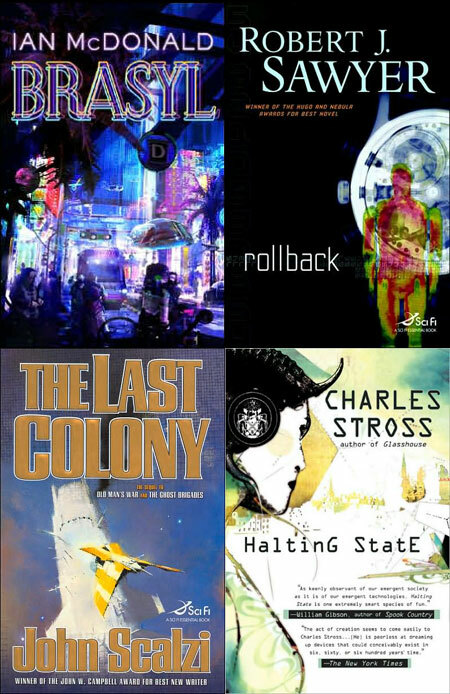 For the duration of the 2008 Hugo campaign, Ian McDonald, Robert J. Sawyer, John Scalzi, Charles Stross and their respective publishers are making special electronic editions of their Hugo-nominated works available at request to 2008 Hugo voters. The authors have put together a package of their books for the voters’ convenience. Where can they get these special editions? Well, right here, of course! Who is eligible to receive this collection? 2008 Hugo voters are eligible. To be a Hugo voter, you must be a member of Denvention 3, this year’s Worldcon. If you are not yet a member, you may become one here. Is there a cost to these electronic editions? No. The authors do hope if the 2008 Hugo voters enjoy the books, they might consider picking up physical copies of Brasyl, Rollback, The Last Colony and Halting State; their mortgages will thank you. However, these electronic editions are provided without cost to eligible voters. I’m a member of Denvention 3, and I’m going to vote for the Hugo! How do I get these electronic editions? Send an e-mail to hugo2008@scalzi.com requesting the editions. IMPORTANT: Your e-mail MUST include the following information: The name under which you are registered for Denvention 3, your full membership number, and your home state/province/country (if not US or Canada). This is so we may confirm you are, indeed, a Denvention 3 member and are thus eligible to vote for the 2008 Hugo Awards. DO NOT PROVIDE YOUR PIN NUMBER. We don’t need that, and as per your bank card, that’s not a number you need to share with anyone else. Information sent to the “hugo2008@scalzi.com” address will be stored by John Scalzi for the duration of the nomination process. After the final day for voting is over, it will deleted. None of this information will be seen or used by anyone other than John Scalzi, nor used for any purpose other than verifying Denvention 3 membership and providing 2008 Hugo voters with the eligible texts. Before you ask if you really have to provide that information: Yes, you really do. Why are you not making this package available to anyone but 2008 Hugo voters? Because this is the agreement by which the publishers are allowing the distribution of the texts. My edition of this package is missing Halting State. We were able to secure permission for Halting State from its US publisher but not its UK publisher. Therefore we are not able to provide Halting State to Denvention 3 members from outside the United States. If we receive permission from the UK publisher, we will post an update and add Halting State to subsequent non-US packages. Where is The Yiddish Policemen’s Union, the fifth Best Novel Hugo nominee for 2008? We were not able to secure permission for it to appear in this package. An online excerpt of the book is available on the Harper Collins site. What format are these editions of the novels? All texts are in rich text format (.rtf) in order to be opened on the widest number of computers and electronic readers. 2008 Hugo voters may feel free to reformat the texts in whatever manner they choose. The texts are packaged in a .zip file. Please note that in some cases the editions you are receiving may be the author’s original final draft and thus may contain copy errors that have been corrected in the published versions. Are these editions of the novels locked down with any form of Digital Rights Management (DRM)? We are asking 2008 Hugo voters who receive these editions of their books not to share them outside their households. Outside of this polite request, there is no DRM applied to any of the text files. Other forms of DRM implicitly suggest 2008 Hugo voters cannot be trusted, and that quite obviously sends the wrong signal. The authors prefer to trust the voters. I’m a 2008 Hugo voter and I’ve sent in my information. What now? John Scalzi, who is administering this program on behalf of the writers, will verify your Denvention 3 membership and then either e-mail you the .zip file containing the texts, or provide you with a URL from which you may download the .zip file. Depending on the volume of requests, this may take a couple of days. Your request may be denied if you have not provided adequate information to verify you are an Denvention 3 member, so please remember to provide the information as specified above. If your request has been denied due to lack of information, you may resubmit with the additional information. If more than 7 days has passed since you submitted your e-mail and you have not received either the file, information on how to download the file, or a denial, please first check your spam filters (your e-mail client or ISP may decide that someone sending you a big .zip file is up to no good); if there’s nothing there please feel free to resubmit your request. E-mail does sometimes slip through the cracks. While the authors do intend to fulfill every legitimate request for these electronic editions, they do reserve the right to refuse to send the texts to anyone, for any reason. Any additional comments or questions? Feel free to drop them into the comment thread. What happens with non-US/UK members? Australia, for instance, gets a fair swag of both editions. Everyone outside the US will get the UK package. That’s pretty sweet, and even though I’m not eligible, I have to say I am appreciative and grateful for the effort you’re putting into it. Well, you can become eligible, with a Worldcon membership. A “supporting” membership is $50 (i.e., less than the hardcovers of all four of these books), and would allow you to vote for the Hugos, and get the ginchy Denvention 3 program guide. And thanks. Credit goes equally to the other authors and their publishers. Is anyone doing anything about the other categories? 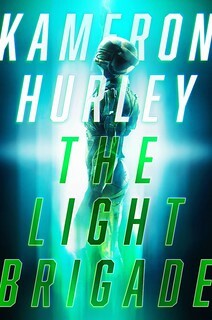 I’ve already read two of the novels, plan on reading a third and the nomination will likely prompt me to read the fourth. (Don’t ask about the fifth.) But I don’t feel right voting if I haven’t read most of everything in all categories. Awesome–thanks, John & fellow authors-who-were-able-to-get-their-publishers-to-agree (though that’s not quite what you said; your phrasing’s open to interpretation ;-). I own and have read The Last Colony and Rollback, but not the other two. I’ll be e-mailing once I dig up my membership #. Thanks again! “Program guide” isn’t quite the right description. It doesn’t contain the program, because that’s not finalized when the book goes to print. What you do get is 200+ pages of a large-format (letter sized) book packed with articles about Denvention 3’s Guests of Honor, WSFS history, color artwork and whatever else the convention sees fit to put in it. “Souvenir book” is the term I normally use. Most of the short fiction is already available for free online. See here for links. There are also links to artist nominee web pages. You don’t need to vote in every category in order to cast a ballot. Very few people are experts in fiction and TV/movies and art and fanzines. There’s nothing wrong with only voting in the categories you know something about. Now there are links to 4 out of 5 of the nominated novellas, novelettes and short stories, and three of the Campbell nominees put out sample short stories, excerpts and in a case a whole book. The deadline is July 7. John, I finished your book “The Last Colony” last night. I’ve already read “Rollback” and I am on to the other two on the download list. Thanks for this opportunity. I will probably not download them. As a matter of fact, I think I will go buy your other two books, “Old Man’s War” and “The Ghost Brigades.” If you will be here in Denver, I would like to get a couple autographs. Thanks. I’ll be there, and will be happy to sign books. Thank you! By the way, I loved “The Last Colony.” If I try to read after going to bed, the book usually hits me in the face within the first page or so when I fall asleep. Last night, I read for an hour and a half before finishing it at 1 AM. Good book. John — This is *so* cool! Thanks to you and the others. Of course, I’ve already bought 4 of the 5 but it’s just wonderful of y’all to do this. Huh. I wasn’t aware I could vote with only the supporting membership. Going to sign up now… and done :). I just became a supporting member so I can vote, which is way cool. I’ve been a science fiction fan since reading The Stars Like Dust when I was 10. I just assumed you had to be in some super secret Hugo club and the only way you could join was to be invited by the ghost of Asimov or Heinlein. Clearly not the case. Thanks for the free downloads, John, haven’t decided if I want to take you up on the offer just yet. I like having physical copies of books and frankly this is just a damned good reason to head over to Powell’s. I just assumed you had to be in some super secret Hugo club and the only way you could join was to be invited by the ghost of Asimov or Heinlein. Clearly not the case. This makes me absurdly happy. Welcome to the secret club, Roger. Please tell your friends. How much does it cost to attend the convention in Denver? $200 to attend; $50 for a supporting membership (you don’t attend, but you get to vote on the Hugos). 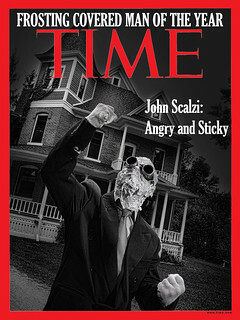 Warning: John Scalzi is obviously biased. Note his statement that Michael Chabon’s book is the “fifth Best” nominee. Haven’t read Chabon’s book yet, I just got it in the aforementioned trip to Powell’s today, but I’ve read “Cavalier and Clay” and “Summerland”. Both highly recommended. In the current field of Hugo noms, fifth best is rarefied air indeed. All any of us want to do is finish above “no award.” It’s not too much to ask. Welcome to the secret club, Roger. So is there a secret handshake or greeting? If not, can I suggest the one John Lithgow used in 3rd Rock From the Sun? Thanks, John, this is now linked to the nomination list. Thank you very much. This makes it much easier to vote… and we’re in the category of “Ooh, I liked it, must buy a copy” so it will increase sales, too. I was able to convert a .rtf file to a .pdb just by reading it into Open Office and then writing it out again in that format. eReader seems to be able to read that .pdb file nicely. Thank you, thank you, thank you! There was recently an amazingly long thread on how to encourage people to vote which, of course, bogged done into minutia. Suggestions that folks do some outreach never gained any traction. At the same time that was going on you were actually doing something about it. I think this is a wonderful idea! One reason is that it emphases that supporting members can vote for Hugos. A lot of folks don’t know that, or if they do, they don’t think that a supporting membership is worth the cost. It will be interesting to see if this effort increases the number of supporting memberships sold, and thus the number of votes cast. I already sent in my e-mail. I put my city and state (Maryland) but forgot to say USA. Do I need to resend it just for that? How literally are you enforcing the rule? If you put city and state, I’ll know the country by context. Country is for folks not in North America. You know, it’s people like you that are the reason my book budget gets blown every month. I’m going to have to invent a new category just for you and call it “WorldCon expenses”. Michael Chabon’s book is fifth best obviously, since it’s published by luddites. Sheesh, if science fiction publishers are not embracing “new” trends like the internet then what hope can we have for other publishers? Count me under “will read on my liseuse or under protest” these days, since I got my PRS-505 I’ve read very little print and the great majority of that has been New Scientist magazine with the occasional newspaper making up the rest. Please tell John that I’m a Denvention member…lol…I cannot find my member number! I’m halfway through “Yiddish” and a fourth of the way through “Rollback” and am enjoying one more than the other. I will create a hierarchical list of my preferences and vote that way. I was able to acquire ALL of these from the Arapahoe (Denver) library system, and I’m sure that I’m messing with somebody else’s ability to vote by holding these books on my nightstand. and you do a search on your own last name, then your name and member number and location as registered with Denvention will come up.